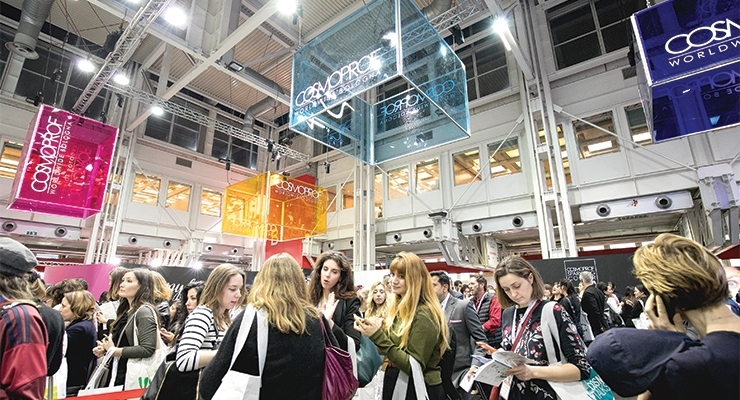 Cosmoprof Bologna’s 51st edition attracted 250,000 attendees and 2,822 exhibitors from 70 countries. 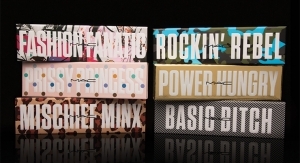 Cosmopack Factory presented Powderful, an all-over, multi-use, multi-colored baked powder compact—with insight into the planning, design and creation of the package. HCT Group’s ‘live, stock catalog’ was displayed in an enormous area of showcases, more than 1,000 square feet in size. HCT Group’s G Collection—a synthetic imitation of goat hair—is the first filament in its “Unreal Series.” They will be adding other popular synthetic animal hairs over time. 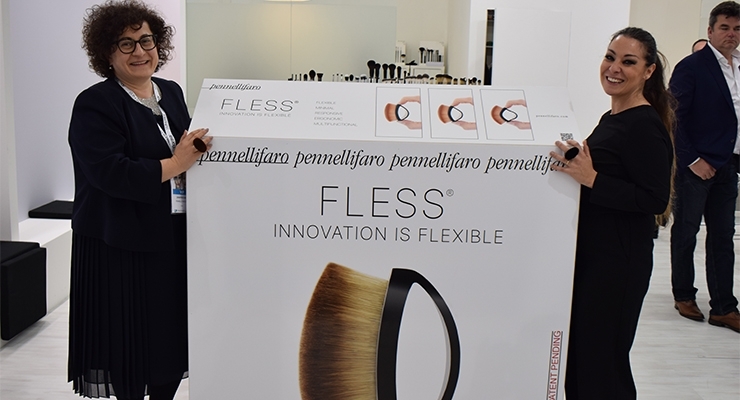 Pennellifaro CEO Sara Zanafredi (L) and Mariangela Porpora present Fless, their new flexible ring brush, which took more than three years to develop. Geka revealed the ‘urbanHEAT’ collection. 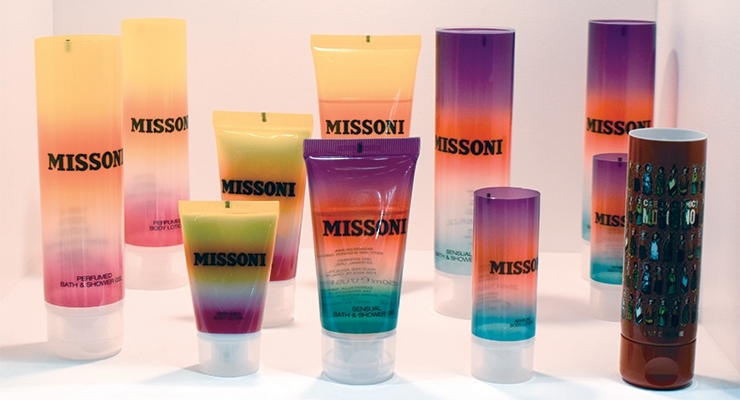 Tubopress Halia presented luxurious tubes, including these for Missoni, which captured the essence of the Italian textile brand. The aesthetic for the Frame range, from Asquan, was inspired by the minimal and contemporary feel of an exhibition showcase or modern picture frame. HCP’s stock offering ‘Radical Ultra’ has a thick-walled bottle construction with a contemporary soft square profile. Premi Beauty’s VIP line, available in 5- and 10ml, is rigid molded glass that can easily be carried in a purse for numerous products. Quadpack Group placed a slice of stone on the side of a glass bottle and the top of a compact for textural and visual appeal. A new family of PETG airtight lip glosses stood out with their squared shape and long neck, at Derik Industrial. Coverpla’s new classic rectangular bottle was launched in response to customer demand. 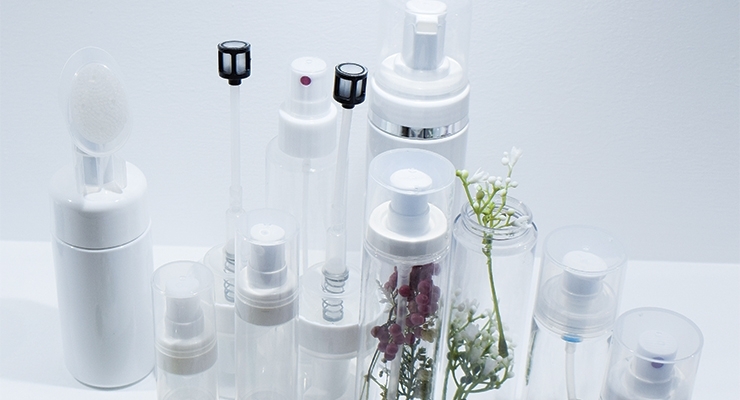 A skincare collection at Elcos features bottles with dip tubes so the formulation can be infused with a botanical scent. 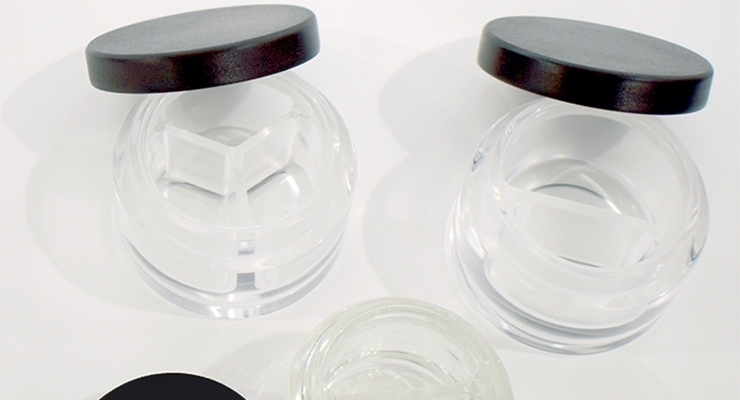 A one-piece patented, customizable glass jar with multiple chambers stood out at Baralan. Refillable packaging, such as these syringe-like packages, is gaining interest at Nest-Filler USA. 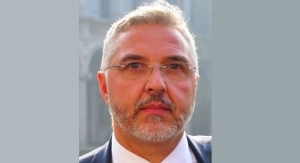 Zignago Vetro: Kelly Gardi, VP sales, U.S.
Cosmoprof Bologna’s 51st edition started out on a lively, upbeat note that carried through the event, which was held March 15-19. 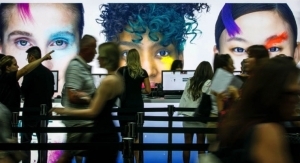 Not only were attendance and exhibitor participation at an all-time high, but vibrant signage and large video screens in the entrance, new features throughout and a revised organization of pavilion openings lent extra energy. 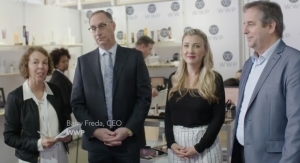 In addition to the 250,000 attendees at Cosmoprof, there was a record numbers of exhibitors too, with 2,822 companies from 70 countries. 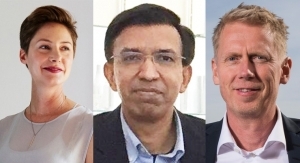 Cosmopack Factory, a popular initiative of Cosmopack, the event-within-the-event dedicated to the cosmetics supply chain, returned for its 6th edition this year. 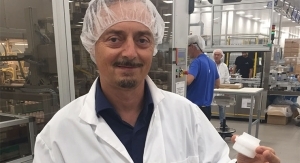 Here, visitors have the opportunity to see a product through from development to shelf, with a look at all of the stages of the manufacturing supply chain, which makes it possible. 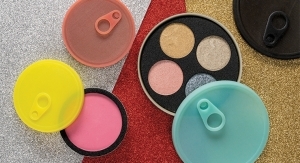 This year, the Factory presented Powderful, an all-over, multi-use, multi-colored baked powder compact—with insight into the planning, design and creation of the package. 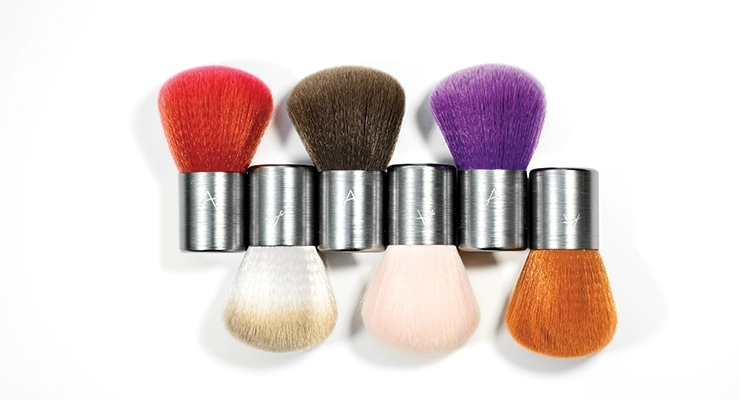 Ease of application comes from a special brush designed to fit into the compact, giving it a playful but elegant look. 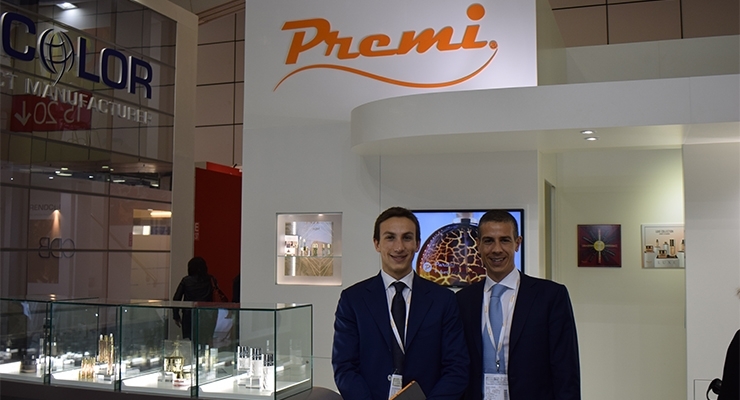 Cosmopack exhibitors that took part in the project were Ancorotti Cosmetics, Ars Metallo, HCP, Nastritex, Pennellifaro and Vetraco Group. 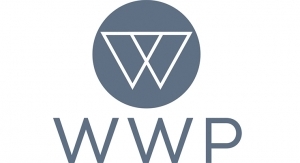 The concept was created by Centdegrés. 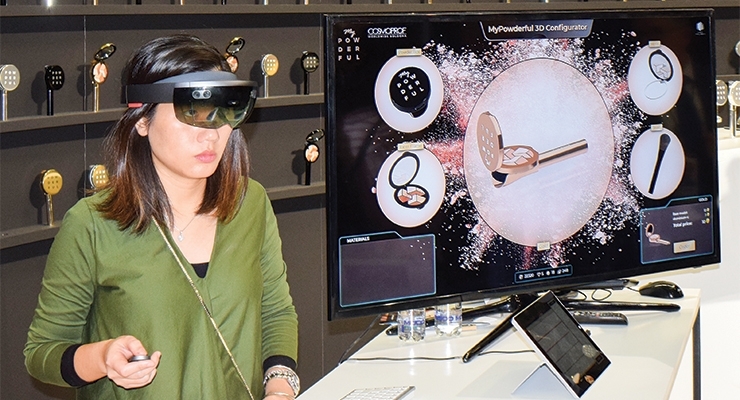 This year’s project was brought to life—and to retail shelves—with the aid of 3D technology. 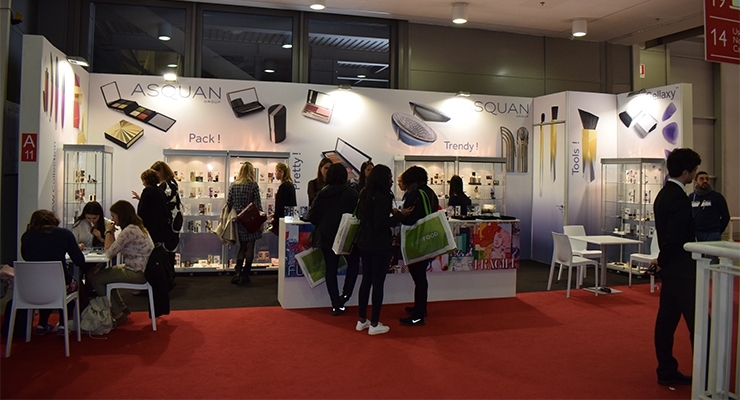 An overall survey of Cosmopack exhibitors revealed a number of trends, including locking mechanisms (caps and closures); a syringe-look; intense metallic hues and finishes; pocket- and travel-friendly packages; big brush news; increased use of glass from color to skin care; and new shapes and sizes. 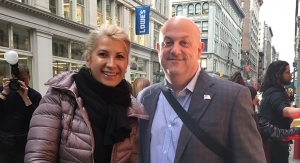 HCT Group stood out this year more than ever before at Cosmopack. Not only did the global supplier occupy a good portion of Pavilion 15, but the many new features they brought this year lent additional excitement and reinforced their theme of “The Future of Beauty.” Pulling inspiration for visuals from the neo-noir film genre, the company had designed a whole new show experience to inspire their customers’ future projects. 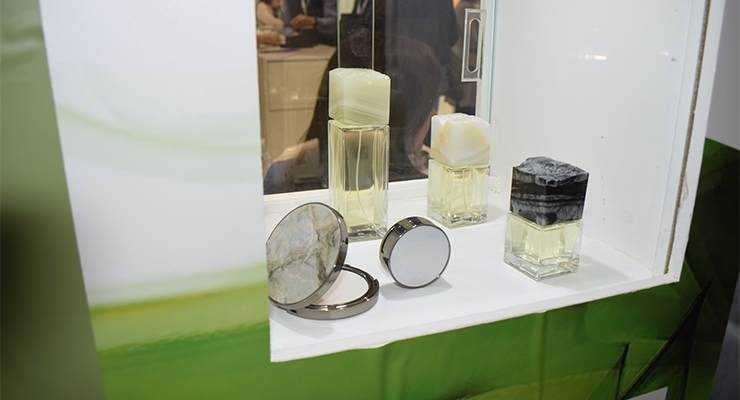 Focusing on looks and packaging of the past with an updated, futuristic twist, current global customers and show attendees were intrigued with the possibilities available in packaging, formulations and brushes. 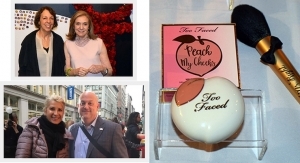 An enormous area of showcases, more than 1,000 square feet, served as HCT Group’s “live, stock catalog,” which included many pocket-friendly on-the-go pieces, such as a dropper pen for color or skincare, and the Lofted Face Stick, a modernized take on the traditional foundation stick. 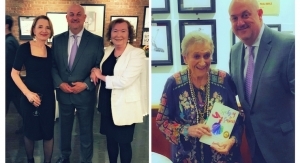 As in the past, HCT Group customers and guests were invited to relax and refresh with pizza, salad, champagne, gelato and more, in the supplier’s adjacent custom trattoria. In HCT Group’s very own beauty studio on the show floor, live makeup demonstrations were underway by professional makeup artists using HCT’s color formulations, specifically “The New Quintessentials,” four vital makeup looks that convey the turnkey supplier’s current perception of beauty through a variety of formula inspirations, ingredient selections, and “sensitively designed” packaging pieces. 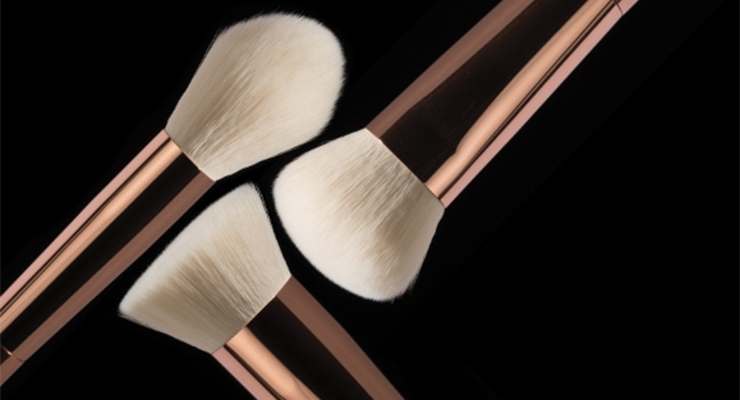 Each formula is perfectly paired with an HCT brush, which was used in the on-site applications. 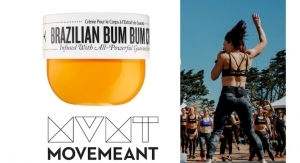 The four looks include: Natural—Curated around natural ingredients with the high performance and finishes, and which features packaging pieces from HCT’s Pure line; Lux—Includes high impact formulas with depth and purpose, and features packaging pieces from the Osaka line; Athleisure—Designed for gym junkies and an athleisure lifestyle with a focus on water-resistant formulas, with packaging pieces from the Block line; and Galactic—Inspired by sci-fi beauty with a focus on distinctive metallic effects for eyes and lips, and which features packaging pieces from HCT’s Oval line. 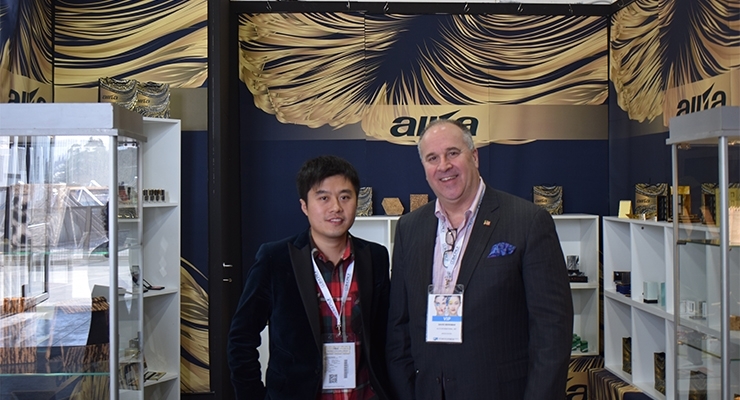 Cat Kong, vice president of sales, Cosmetic Brush Division, HCT Group, showed Beauty Packaging some of the special filaments being offered in the supplier’s brushes, and made in their own factory. Kong said that while some customers still prefer real animal hair, HCT has committed to replacing natural hairs with carefully crafted synthetic filaments that seamlessly duplicate real hair. The “G Collection” is the first filament in HCT’s “Unreal Series.” This filament is a synthetic imitation of goat hair, and they will be adding other popular synthetic animal hairs to the Unreal Series over time. “The G Collection offers parallel benefits with environmentally conscious and vegan features.” Not to mention, they feel wonderful, too. 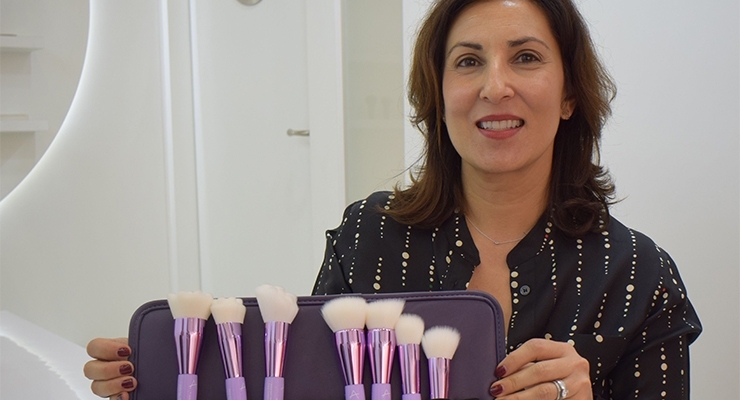 Anisa International revealed a number of brush collections at Cosmopack. One in particular that caught our eye was the Mineral Spirits Collection, which interprets and “infuses the essence of six distinct crystals into six unique fiber offerings,” explained Anisa Telwar, CEO. The crystals are ground extremely finely in order for 2% of their properties to be infused into the fibers. The energy represented by these minerals is captured in the color of the fibers. For instance, Rose Quartz is the stone of love, tenderness and spirituality, and restores trust and harmony in relationships and unconditional love. Citrine is the stone of abundance and manifestation, and stimulates the brain, strengthening intellect. Additional offerings in the colorful collection include Sunstone, Ruby, Amethyst and Smokey Quartz. Pennellifaro was launching a new brush at the show, a flexible ring brush “like no other,” said Sara Zanafredi CEO, adding, “It’s the first flexible brush on the market.” The patented brush, called Fless, which Zanafredi says took more than three years to develop, adapts to texture and to gesture, and is ideal for both powders and liquids. It simply slips onto your finger for a new minimal, responsive, ergonomic and appealing gesture. It is made of Pennellifaro’s own synthetic fiber, that has been dermatologically tested. The flexible handle is available in a variety of shapes and colors—and is ideal for branding opportunities. 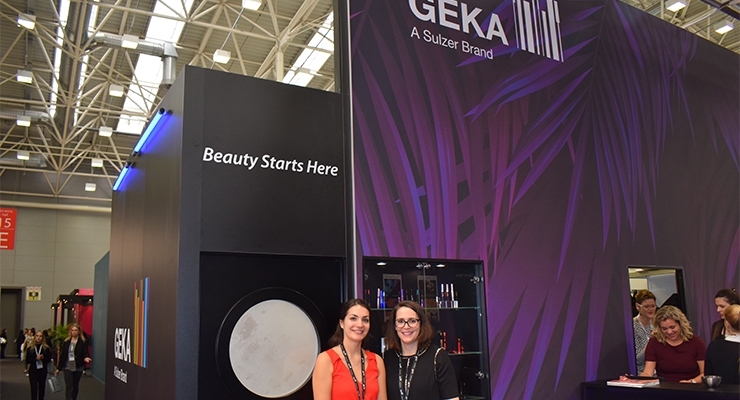 The brand-new mascara brush lashDIVINE is called Geka’s star of molded brushes and is manufactured with the supplier’s 2K Sandwich technology. With alternate rows of shorter and longer bristles, this brush is conceptualized for extreme volume and its bristles on the tip give an extra push-up effect and accentuate tiny lashes. 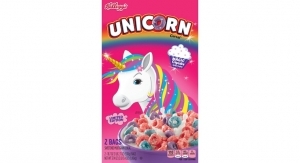 The packaging is molded in a special blue masterbatch, which shimmers and changes color depending on the incidence of light for an eye-catching finish at the point of sale. A second mascara includes Geka’s tropicalEYES twisted wire brush made of the supplier’s new sunshineFIBER. Housed in deep green lacquered packaging, with fluorescent silk screen printing, it reveals its real beauty only when placed under a black light. 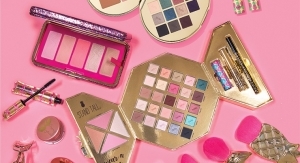 A trendy mini pack with gradual lacquering in tropical shades and vibrant pink silk screen printing is an eyebrow product. Lips are not forgotten by Geka, with the flexiKISS, which adapts gently to the shape of the lips for an even application. The cap is marble-molded “in the colors of daybreak’s first light and every part is unique,” said Gunz. Eyeliner and lip liner applications were also features at Porex Precision Cosmetic Applicators, where Rusty Martin, global marketing director, showed Beauty Packaging the supplier’s new technology: a reservoir for cushion compacts, which he said “solves the issues of the patented reservoir.” They own the patent for the porous fiber cushion which is used as a sponge. The porex foam cushion is an improvement from the foam cushion which doesn’t bring all the fluid to the surface (the fluid doesn’t stay in the foam). 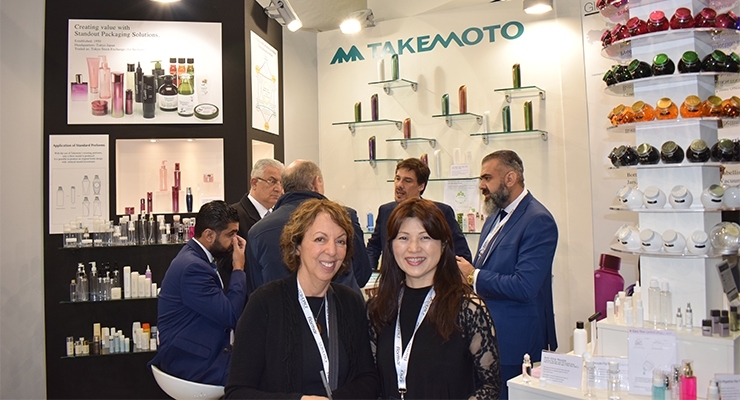 Takemoto has also expanded its Color Cosmetics packaging products with items such as controlled droppers and compacts. 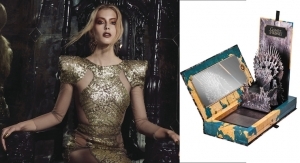 Components decorated with masterbatch metallics, which Fukada says, “are less expensive and better for the environment than metallization,” were particularly eye-catching. At Asquan, the focus was on Spring/Summer 2019 trends, with “lots of saturated brights, and feelings of escapism and optimism. 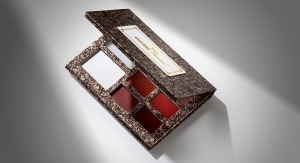 Intense metallics, color floats and suspended formulations gave packaging a modernist vibe. An aluminum brush with a cover resembled a matchbook—and had an androgynous look. 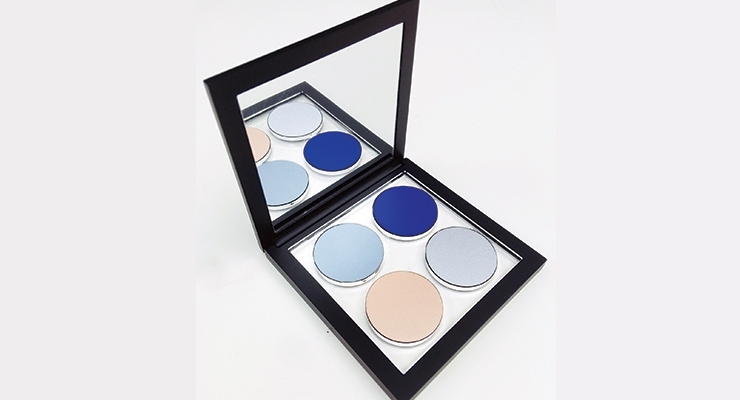 Color Float eye shadow framed a quad of circular color pans in a clear case. The aesthetic was inspired by the minimal and contemporary feel of an exhibition showcase or modern picture frame, according to Rebecca Goswell, global creative director, and the product pan is suspended in a clear, thick sectioned base insert “which adds weight in the hand while still keeping a chic, slim sectioned profile.” In addition, a small square package called The Chicklet can be tucked away anywhere for a quick-on-the-go application. 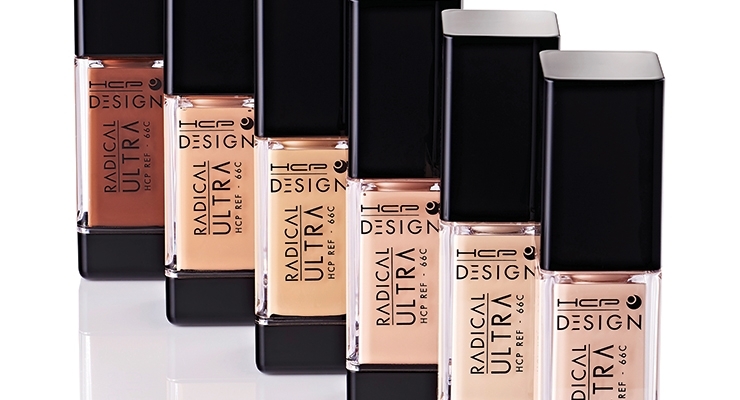 HCP’s stock offering ‘Radical Ultra’ has a thick-walled bottle construction with a contemporary soft square profile. 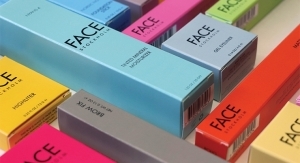 It is versatile for a variety of product categories including concealer or foundation when color ID is required. 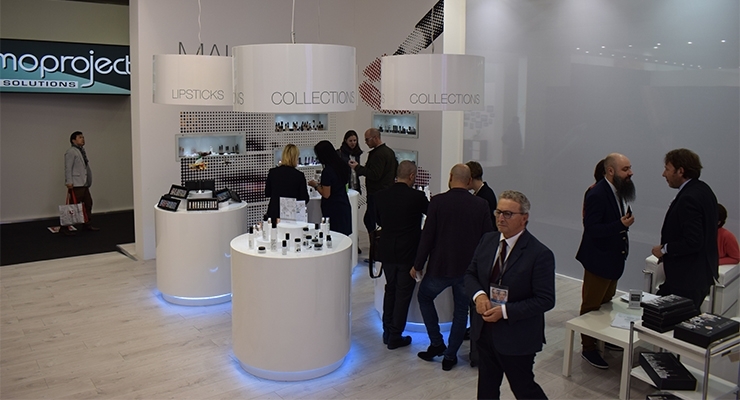 Quadpack, with multitudes of packaging options ranging from cosmetics to skincare, to fragrance—and materials from glass to metal to wood—had created a 2019 Trend Wall, to encourage visitors to think about the many possibilities available in both custom and stock. 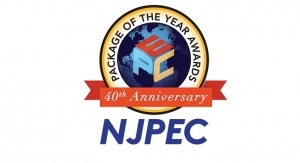 “You don’t have to start from scratch to produce an innovative package,” said Sarah Eaves, marketing team leader, Quadpack Group. One trend placed a slice of stone on the side of a glass bottle and the top of a compact for textural and visual appeal. A large jar with a candle inverted in the bottom can be turned upside down when the product is used up, and repurposed. A sunscreen stick turns color to indicate the SPF level. 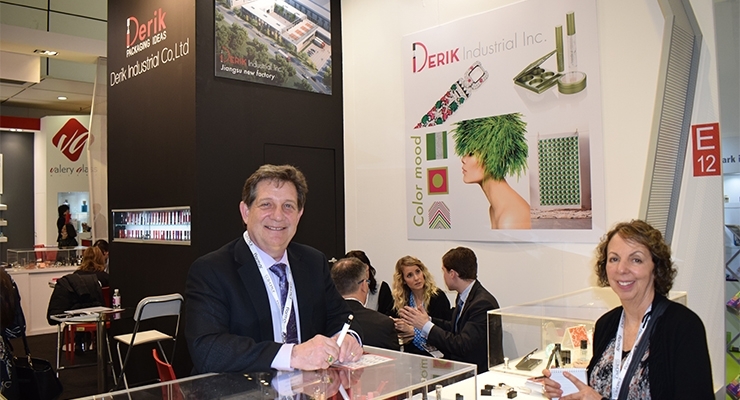 Derik Industrial showed a wide range of components at Cosmopack. 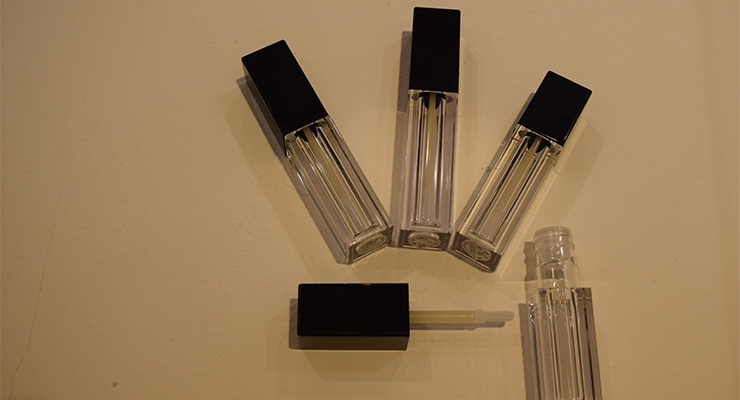 A new family of PETG airtight lip glosses stood out with their squared shape and a long neck. 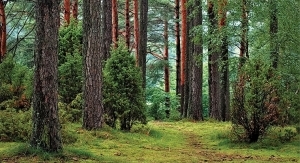 They are also available in a rounded shape; no cheater bands are required. Adding to their versatility, the same bottle is available with a variety of caps, and they can be decorated in a number of ways. Another popular product is a concealer click pen with a sponge applicator for under-eye coverage; its patented mechanism greatly reduces the number of clicks to prime. 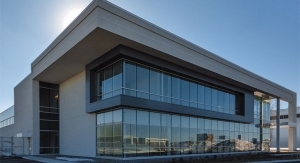 Derik Industrial is currently building an ultra-modern factory in Jiangsu. 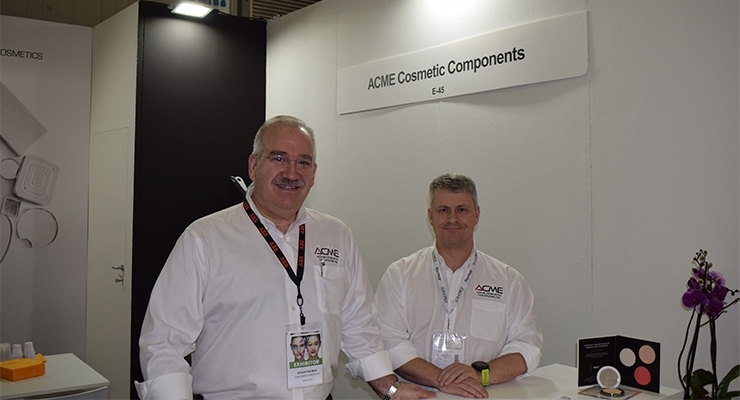 Acme Cosmetic Components was exhibiting on the Cosmoprof show floor, having made the trip from back here in New Jersey. 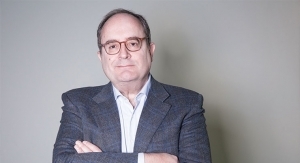 Mike Roughton, president and CEO, said they were “working hard to build capacity in Europe.” The supplier specializes in 10,000 minimum aluminum and tin-coated steel pans and godets for dry blushes and compacts. Coverpla displayed its many glass solutions. 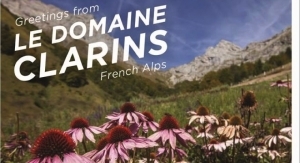 New for the show was its simple and classic rectangular bottle which was in demand by customers. 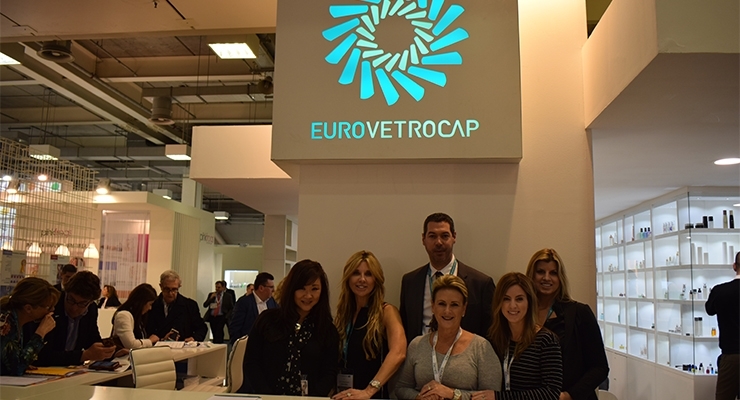 Eurotrovecap launched what they called a “truly green cosmetic package.” Through a collaboration with Zignago Vetro, the Licata jar is described as the first green cosmetic jar made of up to 90% recycled glass. The lid is made of post-industrial recycled PP and a 100% post-consumer recycled shive, and is 99% shielding from UV radiation. 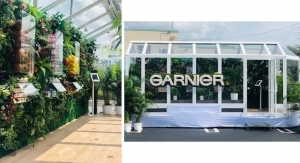 It boasts reduction of CO2 emissions of up to 36% compared to the same item in standard transparent glass. 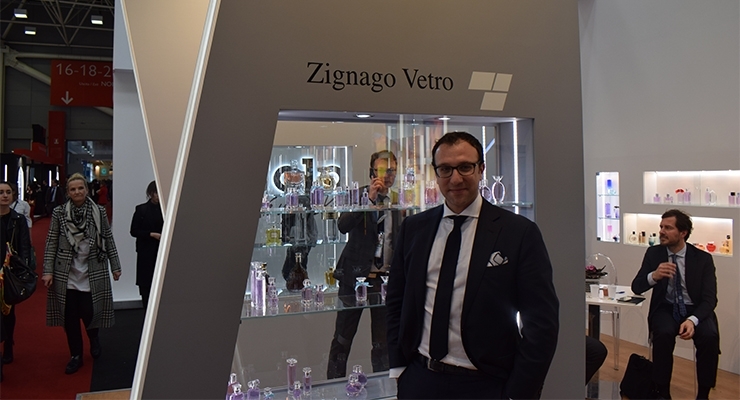 Zignago Vetro’s stand was brimming with sparkling options in glass. 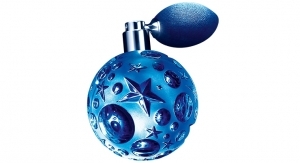 One of their latest achievements, the “Up and Down” is a 100ml bottle with a 50ml fill. The thickness of the glass is uniform on the top and bottom of the bottle, for high-end luxe appeal. Piramal Glass was excited about a new rotary machine for producing small MOQs, as little as 20,000 pieces. The automated machine produces a thick bottom. Piramal also offers grinding and polishing on the bottom. 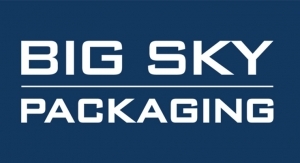 Allta Packaging featured a wide variety of patterns and textures that can be used for cartons or paper cosmetic components. Collapsible gift boxes that ship flat were getting a lot of attention. 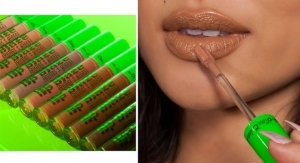 Alkos had launched a new format for their very popular Chubby Stick—an in-demand medium size. 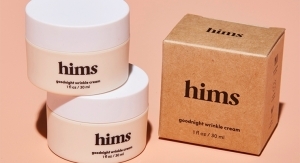 Laura Mariani, marketing manager, said the supplier’s new skincare formulas in deostick shape, such as a new, large twist-up Body Butter stick and Exfoliating Charcoal Sticks—both ideal for travel—were receiving lots of attention. 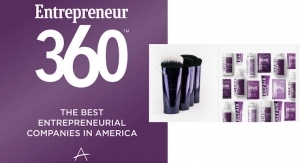 Alkos’ newest makeup product was the Invincible 24-hour eyeshadow, available in plastic jumbo and medium twist formats. 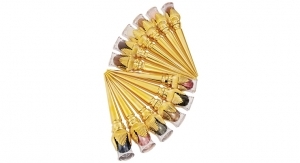 Its gliding gel texture transforms into a super comfortable and thin film on the eyelids and achieves intense color. 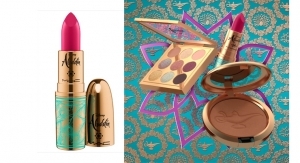 Long-lasting metallic lip colors were also popular. 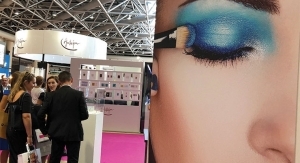 During Cosmopack, Faber-Castell Cosmetics presented their latest ready-to-market concepts like hybrid textures for brow styling, mega-shine metallic gloss and liquid liners for “hypnotic” eye makeup. 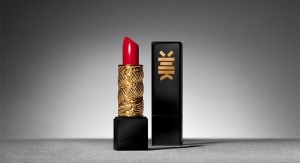 Hydra-light lip stains with 3D-effect gloss or deep, satiny lip combinations for gradient lips were featured. Pigment-rich liners that glide on, and can either stay sharp or smudge, were also popular. 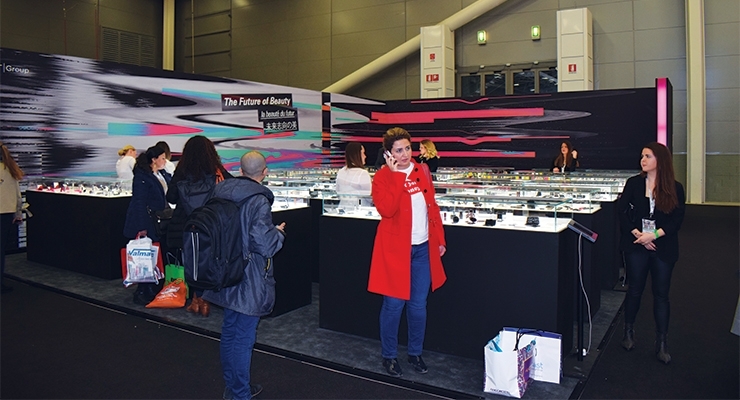 Lumson, in an attractive, new, bright, spacious and airy stand, launched a new collection at Cosmoprof Bologna, entirely designed and manufactured in Italy. 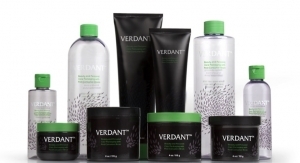 The Unique Collection features a “drop” shape and includes five elements: a 30ml glass bottle and airless bottle, a 50ml glass jar, and two plastic bottles, 100- and 200ml, which can be matched with pumps or screwcaps/dispensing caps and which are totally customizable—and give brands a large choice, according to Federica Bonaldi, marketing director. Lumson also featured its full range of lipsticks with different shapes and deco techniques. Visitors to Lumson’s stand were invited to rejuvenate with a beverage and an array of delicious bruschetta served up from a grill located within the booth. 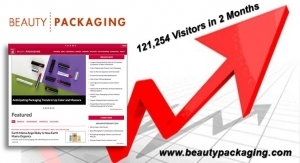 Baralan presented a wide array of cosmetic packaging for categories from skincare to nail. 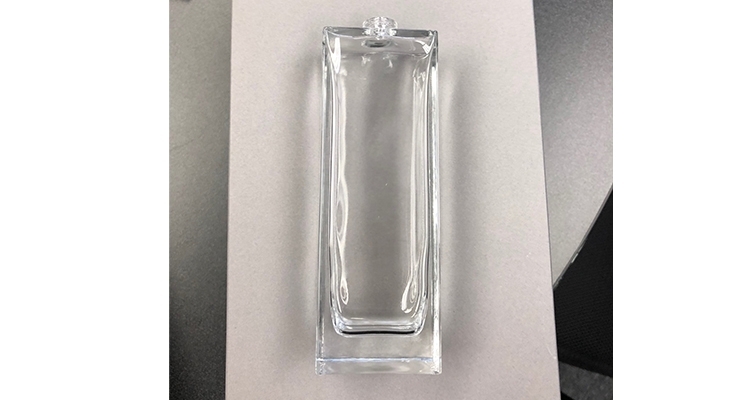 Jim Slowey, marketing manager, Baralan, showed Beauty Packaging a one-piece patented, customizable glass jar with multiple chambers. Ideal for luxury skincare, such as day-night treatments, the divider is movable within the mold. Slowey said more people are asking for glass. 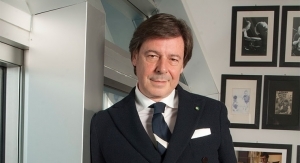 He also said that the nail polish market has evolved, with customers requesting custom designs as well as looking for new ideas in stock packaging. 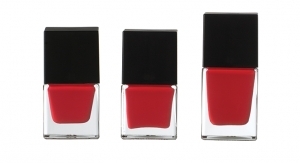 An attractive bell-shaped bottle for nail polish was available with a wave or non-wave pattern. 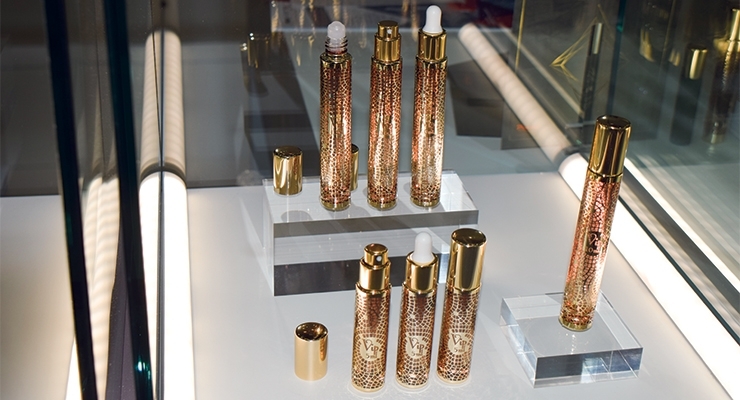 Elcos displayed a number of families of luxe packaging ideal for skincare. 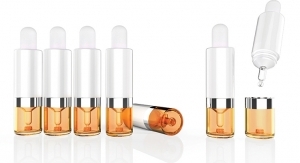 One skincare collection featured bottles with dip tubes that contain filters so they can’t clog. 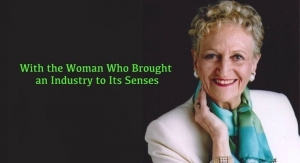 This enables the formulation to be infused with scent, such as from rose petals or herbs, or any botanicals. 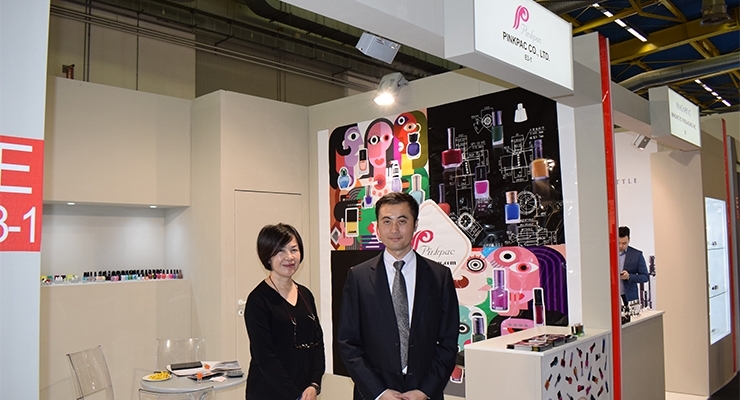 Michelle Joo, vice president, Elcos America Inc., said: “This is very trendy in Korea right now.” Beautiful prismatic shapes for bottles and jars drew attention as did a water-drop shaped insert. 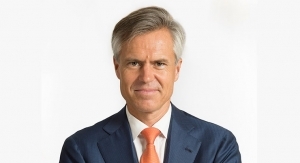 Refillable syringe-like packages stood out at Nest-Filler. One example has a window cut-out in the tube. 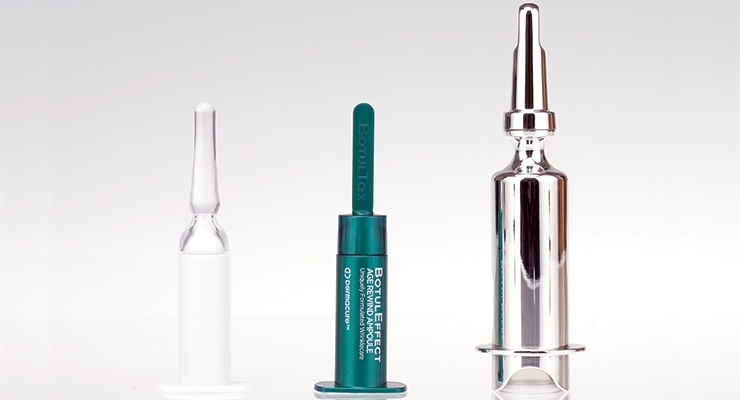 A silicon applicator, available in 5- and 10ml is an affordable feature. An airtight mini syringe can be filled from the top, as it has a piston plug on the bottom. 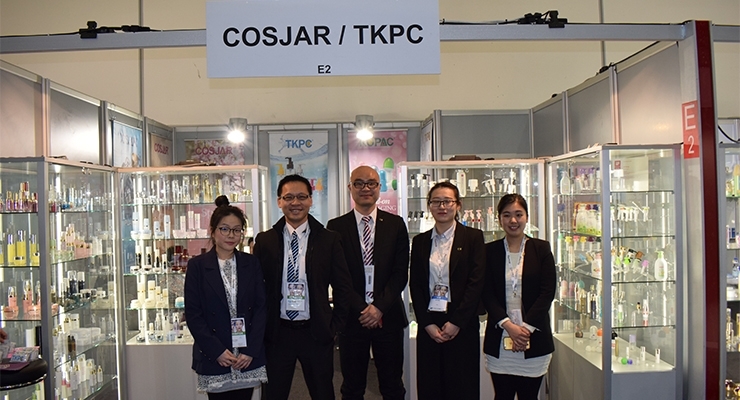 Cosjar TKPC highlighted complete families of round, airless bottles made of PETG, all produced at their factory in Taiwan. 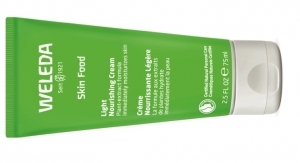 A pump with three multiple dosages—0.2, 0.3, 0.5—for different uses, can be selected depending on variables such as skin dryness, or day and night treatments. The pump fits any standard size 24 neck. 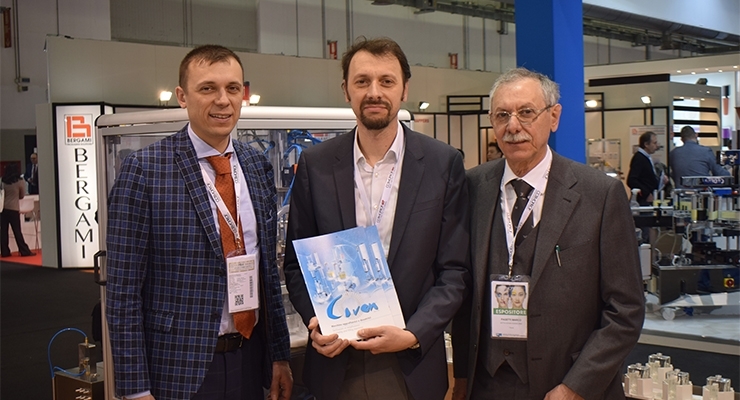 Roland Personalizzazione Cosmetika, which has an office in LA, presented digital printers for personalization of glass, plastics and cartons. The printers have various capabilities. For instance, they can personalize 10 cartons with 10 different graphics. Caps for jars can be printed with 3D effects. 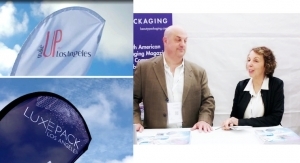 A number of suppliers at Cosmopack addressed various needs and options relating to environmentally responsible packaging. 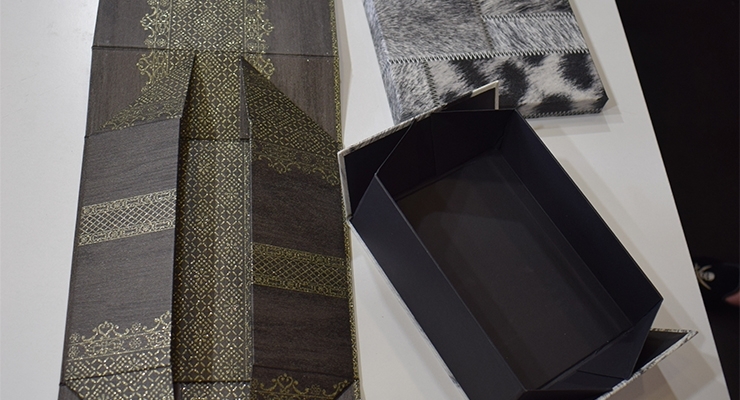 This new material (70% cork, 30% rubber-blend) uses less petroleum-based materials, while giving the component a natural look and feel. Sughera components can be made in a variety of colors. It can be recycled in the general recycling stream. 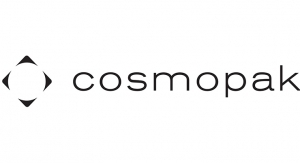 Next year’s Cosmoprof will be held March 14-18, with Cosmopack running March 14-17. In the meantime, head for Cosmoprof NA in Las Vegas, July 29-31.